It was bound to happen—after all, McDonald’s Monopoly game could net customers a new ride or a nice pile of cash. So, in the ultimate instance of one-upmanship, 7-Eleven is now offering customers a chance to go to space—easily the dopest prize offered by a junk food chain ever. The catch involves the chain’s cross-promotion with Foursquare for the marketing of J.J. Abrams’ upcoming film Super 8. Purchasing slurpees, big gulps, and dutches from 7-Eleven isn’t required. Instead, folks need only to check-in to win any of the 21,000 prizes. 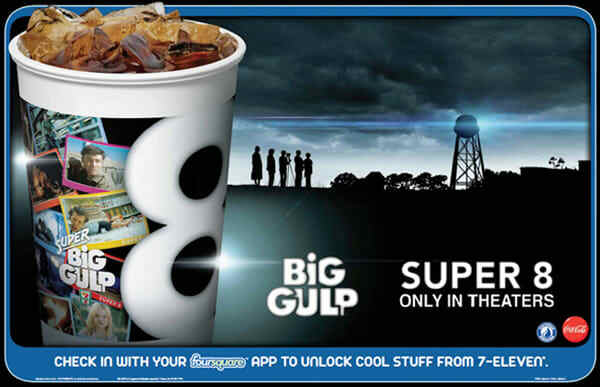 Every 88th check-in scores free tix to Super 8, every 88,888th check-in wins a free Zero-G experience aboard a Boeing 727 engineered for indoor weightlessness, and if there are over 888,888 check-ins over the course of June, one lucky slurpee aficionado gets to go to space. Somehow. Head over to http://checkintospace.com for the full rules. Read the fine print. Super 8, starring Elle Fanning and the coach from Friday Night Lights, hits theaters on Friday.